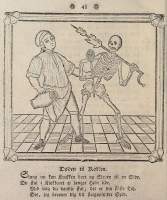 Throughout the Middle Ages the dances of death were spreading - all the way up to the cold North - partly through translations of books from Lübeck: Copenhagen's Dance of death, Dødedantz and "Den Lybekske Dødning-Dantz" (the latter is a translation of Schlott's "new" text from 1701 and is available in the Danish section). This section treats those Danish dances of death that aren't translations of Lübeck's dance of death. One very original book is Typus Omnium Morientium from 1622 where the dialogue for each dancing couple starts with Bible quotes that are supposed to be Death's or God's words - followed by rhyming verses that sometimes are the defence of the human and sometimes are an elaboration of Death's (or the author's) criticism. The good thing about dances of death (from the author's point of view) is that Death comes as a messenger from God and therefore the author - with Death as his mouthpiece - can call down the wrath of God on the heads of his enemies. This is obvious in the case of the landlady in Berlin's dance of death and the usurer in Typus Omnium Morientium. But when the dance of death falls into the hands of a young rebel like Niels Prahl - who published Døde-Dands anonymously - the result is a double-barrelled blast against everybody: the pope who is selling indulgences but himself is afraid of Purgatory, the "infidel" Jew and Turk, the old, wrinkled woman who refuses to die etc. etc! Some of the frescoes in Danish churches - are "real" dances of death, namely in Nørre Alslev and Egtved - whereas the dances in Jungshoved and Ørslev are a different kind. And let us not forget the cities that used to be Danish: Malmø and Ronneby. The section is rounded off with a Danish eyewitness: Hans Christian Andersen who visited the painting in Lübeck's Marienkirche and described it in two of his books. The Danish version of this section has a few more page — including the story about the Danish flag that was the world's oldest flag, until it perished in the fire in 1942 along with Lübeck's dance of death. But only in the Danish section of this site.